According to the data reported by W3Techs, 32.2% of the web is run on WordPress. That's nearly one third of the Internet. It's no wonder, since the WordPress CMS (content management system) has grown into a very robust and powerful content publishing tool. But with great exposure comes great susceptibility. The popularity of WordPress also means that hackers regularly target it and some do succeed. It isn't because WordPress isn't secure or easy to hack, it's a sheer numbers game, similar to why there are more hackers targeting Microsoft's operating system versus Apple's. Out of the box, WordPress' security is relatively good but them pesky hackers are pretty clever and persistent, so taking some extra steps to further lock down your site beyond the initial installation can save you some potential headaches and costs. The technical tips in this article aside, the biggest reason why hacks like these occur (in my experience, anyway) is almost always because of carelessness on the part of the site owner, not because the site is on WordPress. These tips will cover all the bases. First and foremost is to have your website hosted on a secure server that provides tools and support to ensure optimal security. Most web hosts provide their users with in interface (typically cPanel), which provides access to various tools and information related to your site's security. Look for a host that doesn't prevent you from accessing these tools on your own and also provides 24/7 support by phone, email, and live chat. We can recommend some excellent options for you if you need. Of course, along with a secure host should come a secure website, so an SSL certificate is a must as well (which is also important for your SEO!). Performing regular backups of your site's data is obviously important, and you can do so either by automating the process or doing it yourself. But really, why not automate it and save yourself yet one more thing to have to remember? One thing I prefer to do is conduct a manual backup every so often and have a site restore process ready to go on the fly should all hell break loose. You should back up everything, but at the very least back up your database and wp-content folder and store it in another location you can access easily, ideally not within your site's root directory (just in case!). Keeping your WordPress installation up to date is crucial, particularly because most updates are security related and the WordPress development team may release core updates as often as two or three times each month. When logging in to your dashboard, you'll see a message that indicates the status of your WordPress installation. If an update is available, you can install it in one click. One thing to keep in mind is that one or more of any plugins you may have installed could stop working or experience some minor issues upon updating your WordPress core. It's wise to double-check each plugin's compatibility with the version you're about to install. In most cases, you should be fine, but plugin conflicts are not out of the question. This is why it's a good idea to always back up your site before updating. Installing a security plugin adds an extra layer of protection that can help keep hackers on the outside. 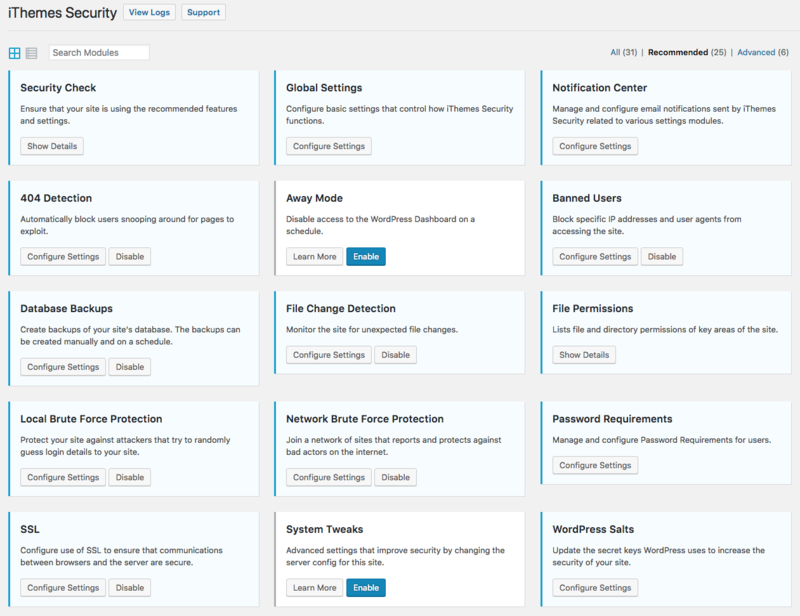 One of the most popular and robust ones is iThemes Security, which can be installed and configured in a few easy steps. It also offers a pro version if you wish to extend its functionality further. If you have any further questions or need a hand in getting started with any of these, let us know! When changing your password, don't be lazy and use an easy one you can remember. Include special characters, numbers, and capital letters. Current versions of WordPress offers this out of the box. Minimizing your use of plugins for your WordPress installation is good not only for security but for performance as well. Not all plugins are created equal, but a general rule of thumb is to limit your number of plugins to about fourteen. Your needs may dictate the use of more, which isn't bad as long as you're keeping tabs on your site's performance. Taking the time to analyze your website for any potential security or performance issues is always a good idea, especially if you have a few cooks in the kitchen making updates and publishing content. If you need a hand getting started in securing your WordPress website, reach out to us!